If you're looking for a super dank hybrid weed strain, Ice may be just what your looking for. This 50/50 hybrid strain delivers an ecstatic buzz with a bit. Smoking a good size bowl (say 0.7 grams) of Ice weed keeps me relaxed and focused for hours. Shortly after using Ice weed, that the strain is a 50/50 cross of Indica and Sativa becomes clear, as standard effects of Sativa and Indica set in. Some grows of Ice marijuana produce buds that deliver a high weighing more toward the Sativa side, while other grows produce pot that feels almost indica dominant. When Ice weed strain is grown to perfection, however, the Sativa and Indica effects should be equally strong. 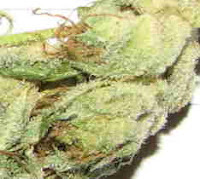 Ice strain marijuana is said to have several medicinal properties. Medical marijuana patients regularly smoke, or otherwise ingest Ice weed for a number of ailments, including the relief of severe pain, stress and anxiety.